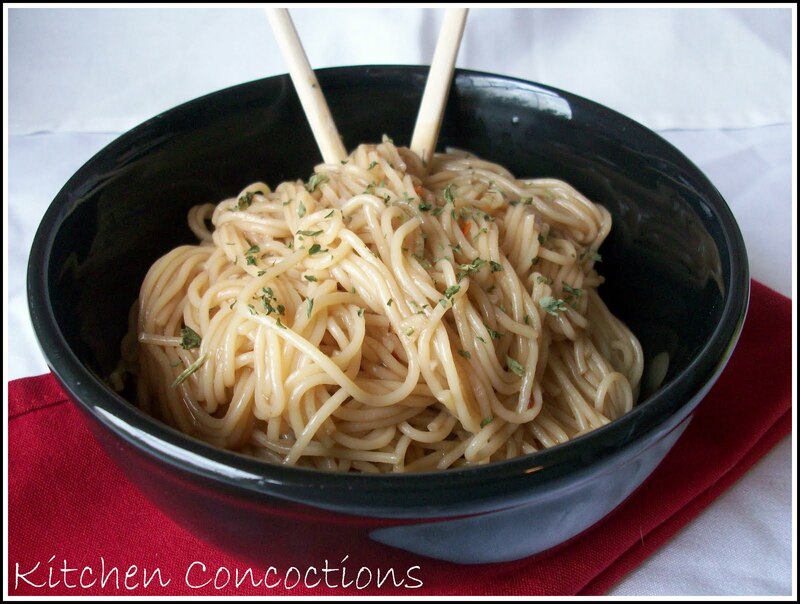 Earlier this week when I shared with you the recipe for the Asian Chicken Bites I mentioned I had served the chicken with some Asian inspired noodles. Well folks here they are in all their simple, yummy glory. These were the most perfect side to that chicken. And would also be the most perfect companion to any Asian inspired dish. They were also great just by themselves. Yup I totally ate this pasta as leftovers the next day when I had no chicken left and these noodles were even more tasty. And yup I really wish I had some right now. 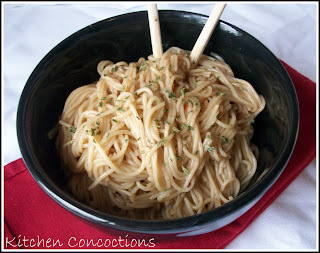 And no I did not eat these Asian Noodles with chopsticks, as you would assume by the picture below. Because here is a little secret about me: I don’t know how to eat with chopsticks. As much as I love Asian food and eat it all the time you would think I would know how; in fact several people have tried teaching me and I still can’t! It is one of my goals though… exactly number 22 on my list of food related things to learn how to do! I guess I had better go make some more of this pasta and start practicing! LOL! In a small bowl, whisk all of the sauce ingredients together to combine. Set aside. In a large pot, bring lightly salted water to a boil. Add the pasta and cook until desired tenderness. Drain and set aside. Pour the sauce over the noodles. Toss to evenly coat pasta. Serve immediately. Leftovers eaten heated or cold are amazing.